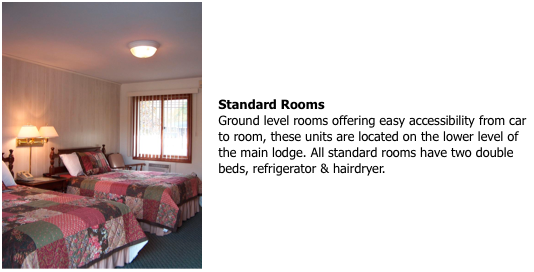 The Kancamagus Lodge offers clean, comfortable and cozy rooms at reasonable rates, within walking distance to fine shops and outlets (with tax-free shopping), area attractions and fine restaurants. Only one mile from Loon Mountain, one of New England’s best ski resorts and only minutes from Cannon Mountain, Bretton Woods, and other recreation areas. All of our 34 rooms are attractively decorated with comfortable single queen or two double beds, television, telephone, fridge, air-conditioning, and all rooms are non-smoking. 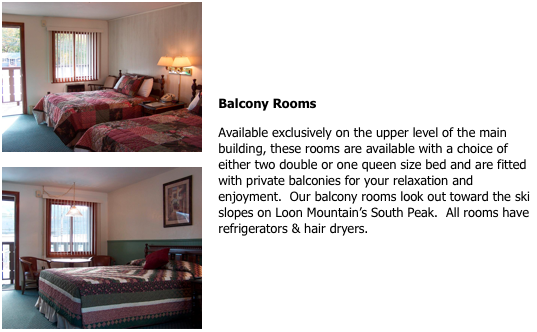 We also have rooms with private balconies and in room steam-bath showers available. Click on Room Type for picture and description! *Rates Subject to 9% NH State Tax. *Rates Subject to a $10 per night increase during peak or holiday periods.